At this point in time, there is no questioning the power of customer reviews and how they influence purchasing decisions. To give you an idea, studies have found that as many as 92% of consumers now incorporate customer reviews into their shopping experience. While there are many review platforms that can help you succeed, Trustpilot has earned a reputation for being the go-to resource for helping growing businesses use customer reviews (both good and bad) to the fullest advantage. Let’s discuss some of the major reasons why. Perhaps the most difficult part of using customer reviews for business growth is simply getting people to write them. In fact, only a mere 10% of customers will actually leave a review after a purchase. However, studies have found that 68% will leave a review if they are asked. This is a number you simply cannot ignore. Actively seeking customer sentiment needs to be a continuous part of your customer review management strategy. Trustpilot does a fantastic job with its invitation and reminder feature. The Automatic Feedback Service (AFS) allows you to send customizable review invitation emails to customers following a purchase. You can set the number of invitations sent out, as well as the timing for when they are sent. Now, creating review invitation emails that actually prompt action can be a little bit tricky. Just like any other form of email marketing, your invites should have a captivating subject line, concise questions, and a clear call-to-action. Thankfully, Trustpilot has tested and re-tested its invitation template hundreds of times for optimization, so simply using their standard invite is always a good option. You can set up reminders if a customer does not respond to the original invitation. In the image above, the user configured the system so a reminder is sent out after two weeks if the customer does not write a review. Reminders can be largely effective in boosting the number of total reviews you get. As reviews are collected, each one is subjected to Trustpilot’s verification process. Due to the program being firmly committed to honesty and transparency, all reviews are thoroughly checked for spam or fraudulent content. Reviews cannot be altered or deleted once they are posted. However, if you believe one is fraudulent or violates Trustpilot’s terms of service, you can report it to Trustpilot for further inspection. Everyone knows how valuable social proof is in today’s marketing landscape. As customers are writing reviews, showcasing them on your website is one of the most powerful psychological marketing tactics. These are known as 1st party reviews. In addition to improving customer confidence, displaying customer reviews on your website can do a lot to improve your site’s SEO. According to MOZ, reviews make up about 10% of how Google and other search engines rank content on the web. Thankfully, Trustpilot makes the technical aspect simple with TrustBoxes. TrustBoxes are Trustpilot’s standalone widgets that can be used to quickly configure reviews directly onto your website. All you need to do is copy and paste the review codes into the HTML of your website. In terms of SEO, one of the biggest advantages of TrustBoxes is you have the opportunity to get Rich Snippets Stars in organic searches with structured data. This is a relatively new function. It takes your TrustScore into account, as well as your total number of reviews. To everyday searchers, Rich Snippet Stars help to create a positive first impression in the SERPs before they even click on your website. In turn, this can do a lot to improve organic CTR and drive more traffic to your site. To get started with Rich Snippets, follow these two steps. Trustpilot is a partner of Google, and due to it being an open platform, Google sees the content as credible. However, not everyone will qualify for Rich Snippet Stars. Google has very strict guidelines for this. While Trustpilot can help, it cannot make any promises that you will get Rich Snippet Stars. Businesses have more touchpoints these days than ever before. Each one presents an opportunity to spread brand sentiment, grow an online presence, and connect with new, existing, and prospective customers. Many would argue that social media is one of the most important domains in this regard. Sharing your customer reviews on the major networks can do wonders to improve your social selling. When it comes to brand messaging on social media, it’s important to realize that typical bottom-of-the-funnel content isn’t always the most welcome. After all, not many people want to be explicitly sold to while they browse their social feeds. If someone comes across your page, displaying genuine sentiment from real people is a fantastic way to get the message across without coming off as pushy. 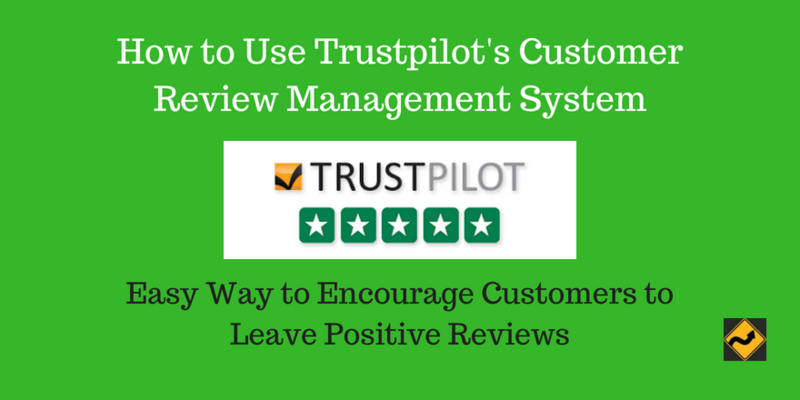 With Trustpilot, you can go beyond just displaying reviews. In addition to text, you can lay an image under the review to make the post more compelling. Using the social media widget, you can select a quick and powerful quote from your reviews, then place it over an image. Once you finalize the image/quote, you can easily share this across your social channels. This process is very simple. Follow these steps to start sharing your reviews on social media. Nearly every aspect of today’s business world operates on big data analytics. Your customer reviews are no exception. In terms of using reviews for business growth, as you could imagine, you need to be sure you are gaining new and genuine reviews on a consistent basis. Hopefully, you have set up goals and milestones (both long and short term) for customer reviews. You need to be keeping frequent tabs on your analytics to gauge how well you are reaching them, spot patterns, and see where you need to improve. Trustpilot’s analytics dashboard is designed with simplicity. From here, you can get a bit more in-depth. For instance, on the Conversion page, you can see how many of your invitations are converting into full reviews. If this number is low, it might be an indicator that you need to rework your emails. On the Insights page, you can see the averages for customer satisfaction. This is where you can get a general sense for how people are interacting with your business over time, and how you can improve. Given the monumental importance of customer reviews, keeping a close eye on how yours progress throughout business growth is something that needs to become a daily habit (if it isn’t already). The “Age of the Customer” is in full swing and doesn’t appear to show any signs of slowing down. That said, collecting, analyzing, and showcasing reviews needs to have a defined role in how you promote and grow your business. Always remember, the reviews you collect and display need to be real and genuine to win over today’s consumers. For this reason, working with an open program committed to generating honest reviews is one of the best business decisions you can make for the long term. If you would like to read customer reviews talking about Trustpilot, see Capterra as one source. A new tool that I just learned about. Trustpilots reveiew management system looks really great for businesses online for their inbound marketing strategies. How much income any site would get from 100 views would vary widely. It depends on the niche and how relevant the ads are and especially on how high the bids are on those keywords. So there really isn’t any way to know. Back when Yahoo! still had their Overture-like pay-per-click ads, the bids were visible. So site owners who had accounts could know what pages to build to target the higher value ads. You could try using the values in the free Ubersuggest keyword research tool and see if that would increase your income. I will study it more, It looks very useful for my clients. Thank You, Dana, for sharing your valuable knowledge. The 68% stat is spot on Dana. I have seen this again and again with my eBooks; when I spent a second or 2 to ask folks for reviews, my reviews rise. I sell more than enough without getting any reviews since I have a large, loyal blog following who buys when I release stuff but it never hurts to get rocking reviews either. Super post and review. wonderful post you presented here. i have few question regard your post. may i ask from you? also kindly detailed explain some points. You can ask questions here or contact Trustpilot directly. Another good way to get answers is to read the Trustpilot reviews on G2Crowd. Can you briefly explain about “Total number of reviews collected”?